St. Louis Car Company Cabooses (11 pages) Washington University Collection. While most well known for their street cars and passenger cars, the St. Louis Car Company also built more than 350 cabooses for Class 1 railroads. This photo essay displays excellent builders photographs of these cabooses. A roster and sample diagrams are also provided. Santa Fe 4-6-2 Pacifics (20 pages) by Richard Hendrickson. The Santa Fe operated a sizable fleet of 4-6-2 Pacifics of the 1309, 1337, 3500, and 3600 Classes. This outstanding article by Richard Hendrickson discusses the history of these locomotives including variations and later modifications made to them. A total of 29 excellent photographs pictorially documents this piece of Santa Fe history. 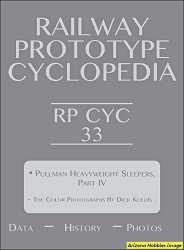 Modeling Plan 3410 12-1 Pullman Cars (11 pages) by Pat Wider. The most common of all the heavyweight sleeping cars was the Plan 3410 series 12 Section, 1 Drawing Room Pullman sleeping car. In the first part of this series of articles on Pullman heavyweight cars, the body of the Riverossi HO scale model is prepared for all the underbody work and final assembly that will be completed in Volume 2. The article provides information on the various air conditioning systems used on these cars as well as six pp. of valuable data that helps put these cars into perspective. 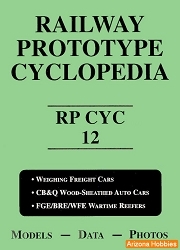 Riveted 40' PS-1 Box Cars (11 pages) by Pat Wider and Ed Hawkins. Pullman-Standard manufactured more than 5,500 PS-1 40' box cars with 6-foot doors and riveted side panels. 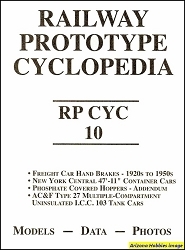 The article provides a roster and ten photographs of prototype cars including numerous cars built for Chicago and North Western. Also, two models are shown that were fabricated from parts of three InterMountain Railway kits. The end result of this relatively easy kitbash is a highly authentic scale model. Missouri Pacific Stockyard (11 pages) by Charles Duckworth. < br />Stockyards were commonly found along the right of way during the 1930s through the 1950s and were an important part of railroad revenue during this period. This article gives an interesting account of shipping livestock by rail along with a fabulous model of a small Missouri Pacific stockyard in HO scale. A complete set of plans is provided along with pertinent information for modeling a stockyard. Frisco's Howe Truss Box Cars (12 pages) by Joe Pennington. The mainstay of Frisco's rolling stock fleet was the 40' Howe Truss box car. In all, 6,500 cars of this design were built from 1926 through 1930. In April 1960, some 4,535 cars were still in service. The article covers the history of the cars including the steel rebuilding program that began in 1953. These distinctive prototype cars can be accurately modeled using kits made by Sunshine Models. 1935 AAR Twin Hoppers, Part 1 (15 pages) by Ed Hawkins. The ubiquitous workhorse of the coal hauling roads, the 33' inside length offset hopper was truly a common car. The article discusses the features and the differences of the 50-ton AAR Standard and Alternate Standard designs as well as one nonstandard design used mainly by Illinois Central. Numerous photographs are presented as well as a four page roster of approximately 127,000 cars built from 1934 to 1960. 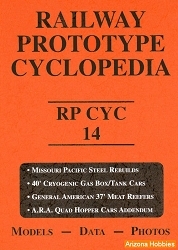 RP CYC Publishing, softcover, 96 pages, 8.5 x 11 x .25 in., B&W photographs and illustrations.